Prometheus is a complete monitoring and trending system with built-in and active scraping, storing, querying, graphing and alerting based on time series data. Prometheus is an open-source toolkit initially built at SoundCloud for monitoring and alerting. The toolkit is now a standalone open source project and maintained independently of any company. 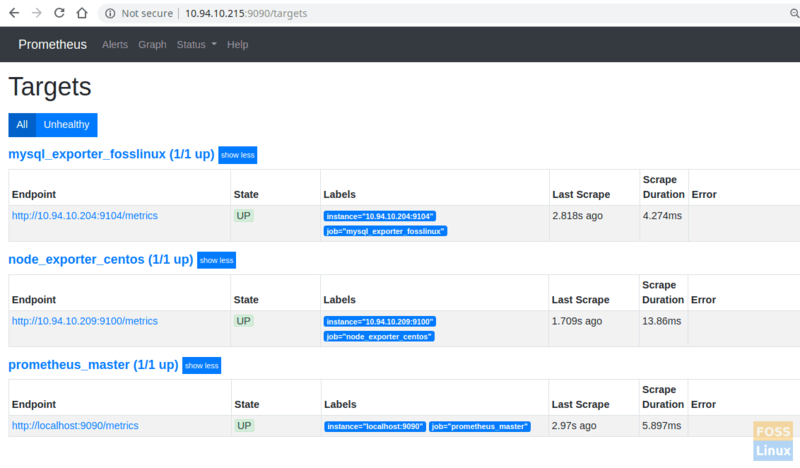 The toolkit collects metrics from monitored targets by scrapping HTTP endpoints on those targets. Most Prometheus components are in Go. Some written in Java, Python, and Ruby. Prometheus works well to record any numerical time series. It fits both machine-centric monitoring and high-dynamic service-oriented architecture monitoring. In addition to making it easier to run and integrate into your environment, Prometheus offers a rich data model and query language. The following tutorial shows steps to install Prometheus on CentOS. Login to Terminal as root, and start firing the commands below. Save and exit the file. Then reboot the system. Go to official Prometheus downloads page, and copy the URL of Linux “tar” file. Change the owner of the above directories. Now go to Prometheus downloaded location and extract it. Rename it as per your preference. Copy “prometheus” and “promtool” binary from the “prometheuspackage” folder to “/usr/local/bin”. Change the ownership to Prometheus user. Add and modify Prometheus configuration file. Now we will create the prometheus.yml file. Add the following configuration to the file. Configure the Prometheus Service File. Copy the following content to the file. Save and the exit file. Use the following Url to access UI. Then you can see the following interface. First, you need to configure Prometheus node exporter on a Linux server. Copy URL of the Node Exporter form the official download page. Create a user for the node exporter. Move binary to “/usr/local/bin” from the downloaded extracted package. Create a service file for the node exporter. Add a firewall rule to allow node exporter. Enable node exporter on system boot. View the metrics browsing node exporter URL. 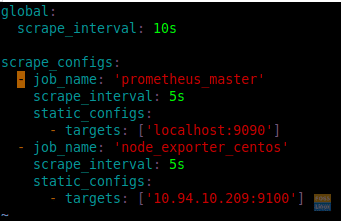 Add configured node exporter Target On Prometheus Server. Add the following configurations under the scrape config. The file should look like as follows. 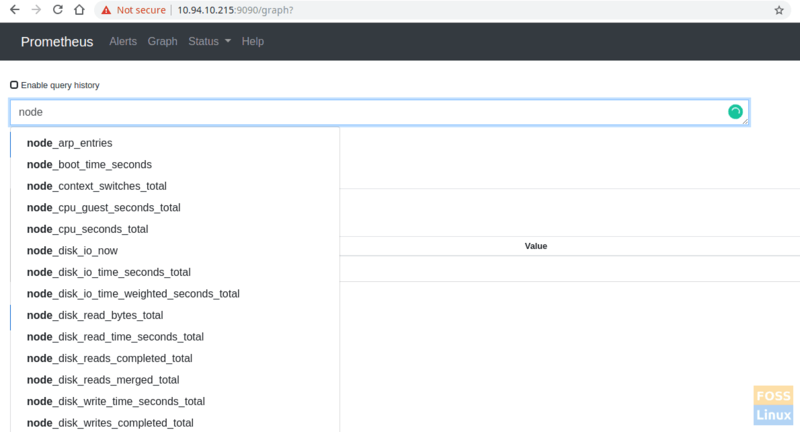 Login to Prometheus server web interface, and check targets. 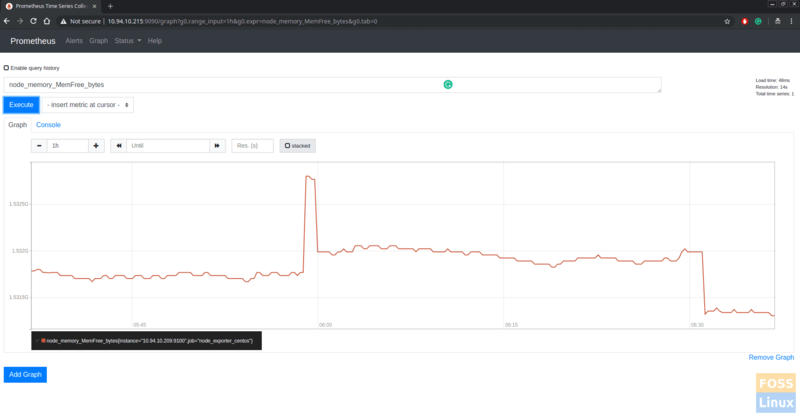 You can click the graph and query any server metrics and click execute to show output. It will show the console output. 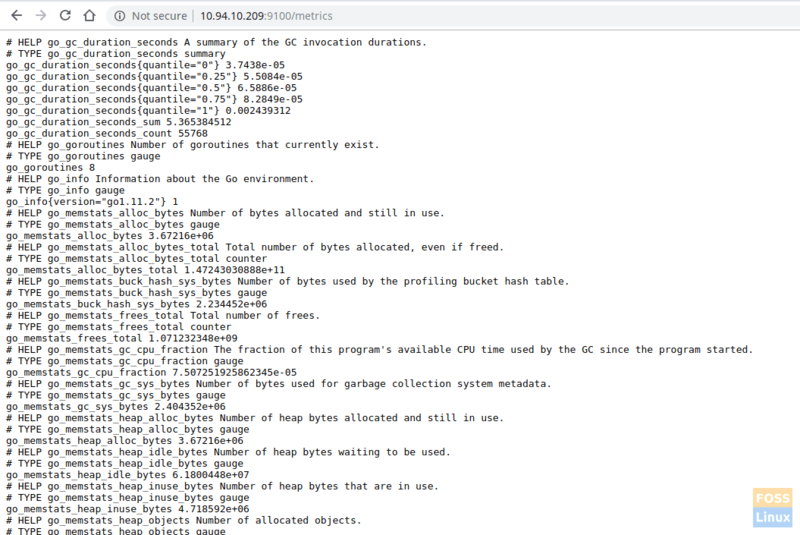 Login to MySQL and execute the following queries. Download mysqld_exporter from the official download page. Add a user for mysqld_exporter. Copy mysqld_exporter file to /usr/bin. Change ownership of the file. Create a MySQL password file for mysqld_exporter. Add the following configurations to the file. Enable mysql_exporter on system boot. View the metrics using the following URL. Now go to Prometheus server and modify the prometheus.yml file. You can see added targets by clicking targets under the status. Now you can select query using query browser and get the result of MySQL server. That’s all about the installation and configuration of Prometheus server on CentOS 7. Hope you enjoyed this tutorial. Let us know your feedback in the comments below. OwnCloud is a popular client-server software for creating and using file hosting services. Using it, one can create a private cloud server instead of relying on paid services like Dropbox, OneDrive, pCloud, etc..